Spring Bull Gallery is excited to feature on Gallery Night Newport a new program, “Meet the Artist!”, starting this coming Thursday, June 11th, 5 – 8 PM. Gail Armstrong, professional artist and gallery member of Spring Bull will offer a personal view of the creative process, entertain questions on painting and working as a professional artist, and exhibit some of her skills and talent for the audience with a painting demonstration. Gail works in both oils and watercolors, and is the recipient of numerous awards for her work. After receiving her MA at RISD, she dedicated herself to teaching high school art for 30 years. 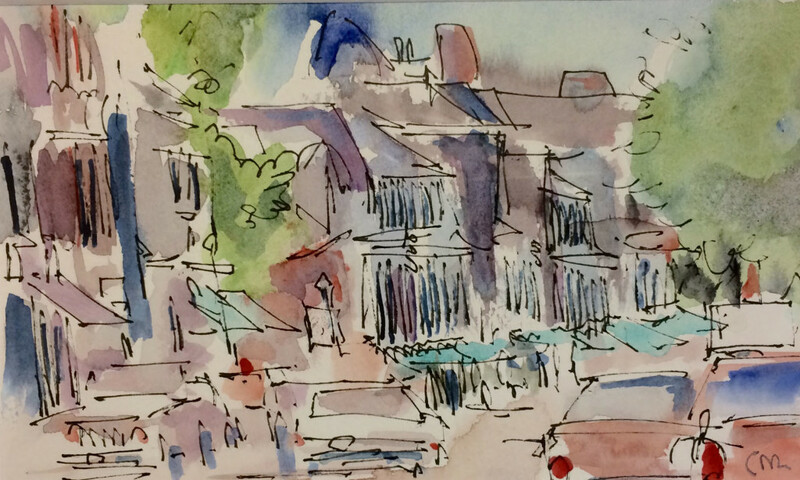 Presently Gail instructs figure drawing at the Providence Art Club, and has taught watercolor there for many years. Her work is on regular display at Spring Bull Gallery in Newport, and at her studio at the Deacon Taylor House, next to the Providence Art Club. Gail is a signature member of the R.I. Watercolor Society, and an exhibiting artist member of the Providence Art Club, Mystic Art Center and the Cape Cod and Wickford Art Associations. Please visit her website at www.gailarmstrongart.com for additional information. Our “Meet the Artist” series for Newport Gallery Night will continue throughout the summer on each Newport Gallery Night, the second Thursday of each month. Look for coming information on our artists featured during “ Meet the Artist” this summer during Newport Gallery Night. Spring Bull Gallery is located on 55 Bellevue Avenue, Newport, is open 12- 5 PM daily with extended summer hours Fridays ’till 7 pm. For more information, contact us at 401 846-9166, www.springbullgallery.com, or on Facebook. 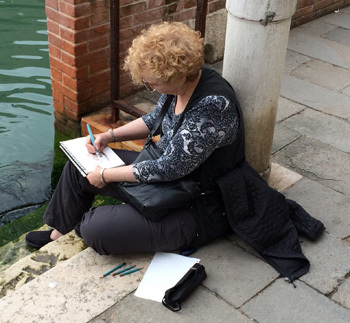 Gail Armstrong, sketching during recent trip to Italy. Photo credit Craig Masten. There are summer treasures to be found at Spring Bull Gallery’s “ Les Petites Oeuvres en Été” Exhibit with an unusal Sunday opening. The exhibition begins with a reception on Sunday, July 5th from 5 -7 pm.. Small artistic gems in oils, watercolors, pastels, graphics, glass and other media by local artists will be here for the taking. The exhibit runsJuly 5, 2015 – July 31, 2015 with work changing daily as new art replaces sold pieces. The gallery will feature Susan Shaw during our Meet the Artist program to be held on Thursday, July 9th during Gallery Night in Newport. Susan Shaw exhibits her work in functional porcelain, oils, watercolor and Chinese Brush painting at her studio and gallery, Shaw Pottery, Wyoming, RI, Spring Bull Gallery in Newport, RI, Charlestown Gallery in Charlestown, RI, Providence Art Club, Providence, RI and other select locations. She teaches painting classes at her studio location. She is an exhibiting artist member of the Providence Art Club, artist member of Spring Bull Gallery in Newport, Rhode Island, elected artist member of the Art League of Rhode Island, elected artist member of Mystic Arts Center, artist member of South County Art Association, Rhode Island Watercolor Society, and member of Newport Art Museum. Making art a personal experience, prompting the evocation of ideas and vision that are unique to the viewer, is the challenge she poses for herself. She creates imagery that resonates emotionally, whether in paint or in porcelain, through her use of color, line shape and form. Her painting is influenced by her background in horticulture and love for the colors and textures of the landscape. Drawn to the complexity of the landscape, she paints in oils and watercolor, using a personal style that offers a visual invitation to look. The feeling of space and form, its visual invitation to see, becomes all important. Susan often paints outdoors in the landscape, frequently finishing a painting in the studio. Quality of surface is essential, as are the ways edges transition and shapes meet in a painting, allowing one’s eye to move easily from one area to the next. Shaw’s ceramics of sculptural and functional porcelain are most appealing for their luminosity, depth, and color response. Porcelain reflects every touch of the hand, is subtle and seductive in its fluidity. She infuses her work with the action of making, wanting to reveal the nature of the material, while keeping movement and color fresh.Painting and ceramics inform each other in unexpected and gratifying ways. Together they satisfy her desire for tactile experience and invite visual pleasure. Her task is finding ways to interpret what she sees and feels, and what she chooses to convey to the viewer – always an ongoing process. Spring Bull Gallery located at 55 Bellevue Avenue in Newport, Rhode Island is wheel chair accessible and open free to the public. Gallery hours are noon to 5 pm. daily. For additional information on this exhibition, future gallery events or member artists please call the gallery at 401-849-9166 or visit the gallery on-line www.springbullgallery.com. 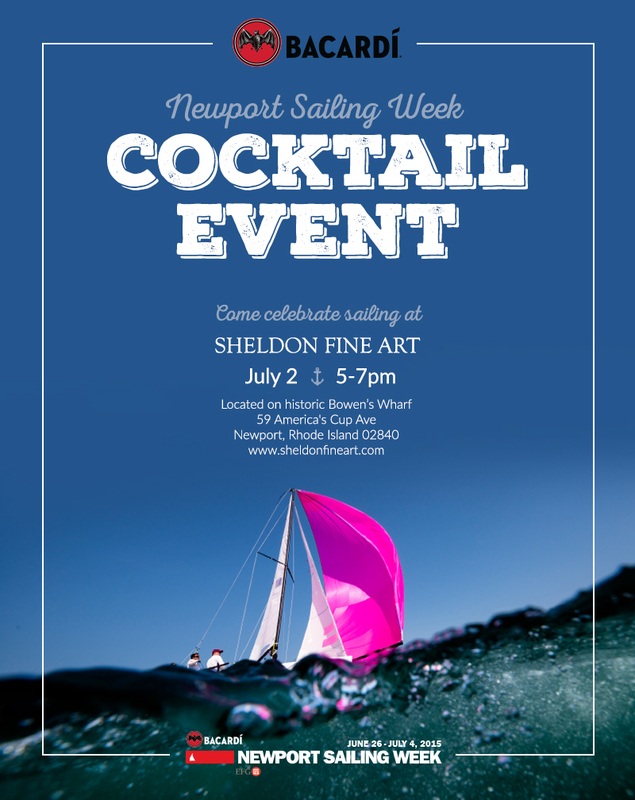 In conjunction with Bacardi Newport Sailing Week, Sheldon Fine Art invites you to a Cocktail Event to celebrate sailing. The event will be held on Thursday, July 2nd from 5 p.m. to 7 p.m. Enjoy complimentary prosecco while experiencing artwork by some of the art world’s most prestigious maritime painters. The event will inspire all who have a passion for sailing and the sea. Sheldon Fine Art is located at 59 America’s Cup Avenue, on the historic Bowen’s Wharf, Newport, RI 401.849.0030. Open daily from 9 a.m. – 9 p.m.